The clear and bright morning of the 7th of October 2009 was to set the tone for the weather of the day. It was going to be a perfect day for an outing to the Tasman Peninsula to look for threatened plants, an emphasis being placed an endangered eyebright, the Peninsula Eyebright (Euphrasia semipicta). Along with 10 other volunteers, I had the pleasure of joining Dr Wendy Potts of the Department of Primary Industries and Water, our local expert on Tasmanian eyebrights, in a hunt for the endangered plant. The Peninsula Eyebright is a short-lived endemic perennial which has been listed as endangered under the Tasmanian Species Protection Act (see Notesheet from the DPIW website). As the common name suggests, the Peninsula Eyebright is found only on the Tasman Peninsula. There it grows on a wide variety of substrates ranging from clayey to sandy soils. 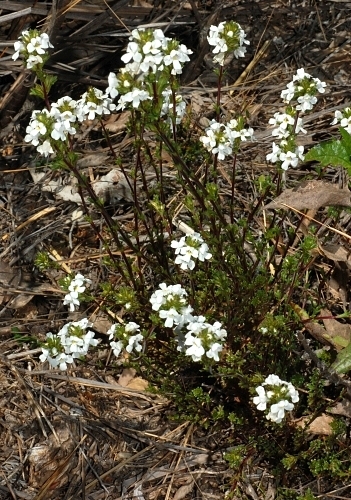 It’s rarity and unique distribution asides, the Peninsula Eyebright has an interesting natural history that may not immediately be apparent to the casual observer. For many years, Eyebrights were part of the Figwort family (Scrophulariaceae), to which well known medicinal plants like figworts (Scrophularia) and mulleins (Verbascum) belong. 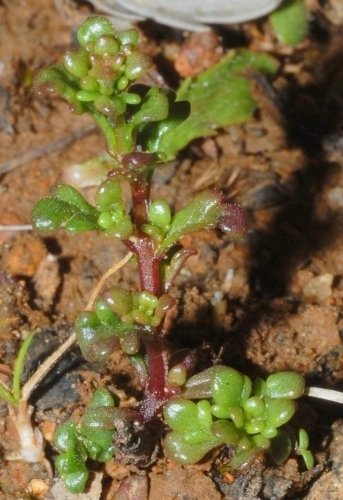 The placement of Eyebrights in the Figwort family however, proved to be untenable on the basis of DNA evidence (Young et al. 1999). In fact, the entire figwort family has lost many of it’s members since the advent of molecular science. Also because Eyebrights are semi-parasitic – a feature not typical of the Figwort family. 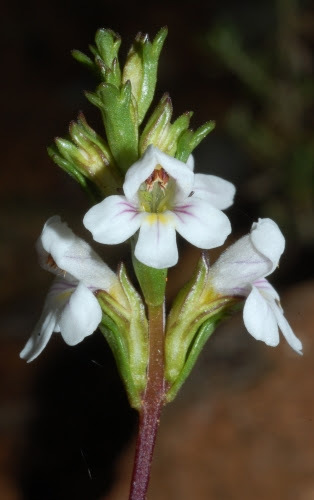 Ultimately, Eyebrights were placed under the broomrape family (Orobanchaceae), which have members that are typically semi-parasitic to wholly parasitic. What the Peninsula Eyebright parasitizes on is still anyone’s guess, a reflection of what remains to be discovered. The Peninsula Eyebright, like some other rare native eyebrights, is quite peculiar with respects to where it lives. In almost every site we visited, we found plants growing near tracks or roads. Wendy says that they ‘like the view’. Being semi-parasitic seems to be tied in with their transpiration rate, and hence the need of exposure to drive that transpiration rate. ‘They can die within two days of being kept in a dim area’, says Wendy. Also, being an endemic component of Tasmania’s flora, the Peninsula Eyebright must have evolved alongside the pyrogenic rhythms of the Tasmanian landscape. It is conceivable that before European settlement, the Peninsula must have relied heavily on aboriginal burning for survival. Arguably, the Peninsula may have been more common before the changed fire regimes brought about by European colonialism. Complex evolutionary processes are at work in the East Coast of Tasmania, and their effects are very marked in the eyebrights. This creates a headache for taxonomists as the species concept is stretched really thin by some of these eyebrights. Just within the Peninsula Eyebrights, Wendy has found and described plants of three different forms that vary in corolla colour and other morphological details (Potts 1997), but as yet, no one has taken any steps to formally distinguish these forms as separate subspecies. We saw two of the forms that Wendy described. One had purplish flowers with striations in the corolla. The other had the same type of striations but with white corollas, and tended to be more squat than the former. In all the localities we visited, the Peninsula Eyebrights appeared to be doing better than the year before, when I had visited the same localities with Wendy. Perhaps it was the good rainfall we got this winter and early spring. We even discovered plants from a couple of new spots. When I contemplate the Peninsula Eyebright, I cannot help but marvel at how nature sometimes graces certain small geographical areas with an expression of plants and animals that are found nowhere else. When, perhaps, in the distant future, natural processes separate the Tasman Peninsula from Tasmania, the Peninsula Eyebright will no doubt be a prime candidate as the icon plant of the ‘Tasman Island’. 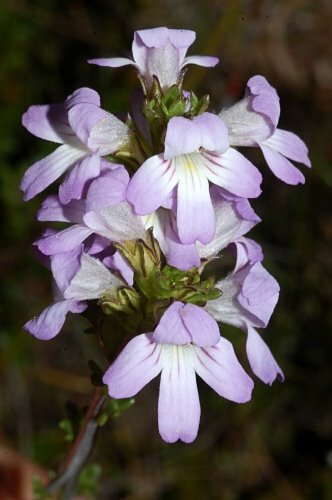 This entry was posted in Botany, Fieldtrips, Tasmanian Endemics, Threatened Plants and tagged Endemic plants, Euphrasia, Euphrasia semipicta, eyebrights, Peninsula Eyebright, Tasman Peninsula. Bookmark the permalink.